Where did Taguig get its name? This is an endearing monument in memory of hundreds of men from Tipas who were captured, brought to and killed by the Japanese in the prison cells in Intramuros, Manila. Names of victims are carved on the statue. Commemorative events in remembrance of the “zona victims”Â� are held every 23rd day of February. On leave-strewn entrance area, and were immediately mesmerized by the tranquil and comforting feeling. Huge, almost ancient, trees lined the perimeter. One tree extended a welcome branch across the paved quadrangle. A sunken garden with a large raised cemented platform in the center–perhaps that was a stage. On the left end of the garden was the Wall of Remembrance, in black granite, immortalizing modern martyrs and heroes “who dared fight the repressive and corrupt regime from Dec 30, 1965 to Feb 25, 1986.”. Ninoy Aquino’s name was on the initial alphabetized list on the left, creating and etched in 2007. As more martyrs gave up their physical bodies, their names were etched on other portions of the wall. 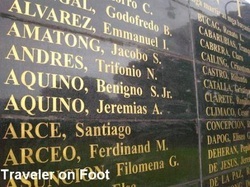 Cory Aquino’s name was on the far right etched on November 30, 2009. The 35-foot high Inang Bayan Monument/ JUSTICE for GREGAN CARDEÑO MOVEMENT in the center of the entrance park, depicts Mother Philippines lifting a fallen martyr but looking at the future, full of hope ad fortitude. The sculpture was designed by renowned artist Eduardo Castrillo. The Bantayog is accessible to many more people, A few more paces, and commuters can get a glimpse of history and the heroism of our modern heroes. A short side trip to the Bantayog Park, on their way home, can help remind us that we ordinary citizens can also be heroes, by simply going the extra mile for country and people. Perhaps then the struggle for a more equitable society will be eased, as each one of us shares a bit of the burden.